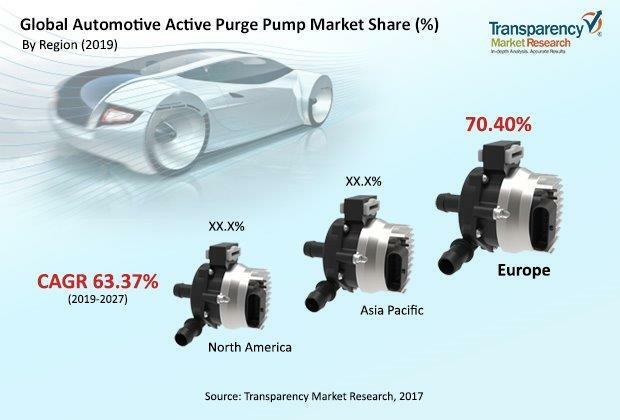 Transparency Market Research has released a new market report titled “Automotive Active Purge Pump Market - Global Industry Analysis, Size, Share, Growth, Trends, and Forecast, 2018–2026.” According to the report, the global automotive active purge pump market is expected to expand at a CAGR of more than 66% during the forecast period. Rise in awareness about emission and fuel efficiency among vehicle owners is projected to boost the automotive active purge pump market during the forecast period. In the transport sector, combustion of fossil fuels leads to poor air quality on highways and city roads. Currently, the quality of air in urban areas is an issue, owing to increased number of vehicles on a yearly basis. Urban air pollution is a serious issue, and according to the WHO, in 2014, more than half the global population lived in cities, and this number is anticipated to increase by 66% by 2050. Increasing focus of governments of several nations on curbing emission caused by vehicles and rising consumer preference for vehicles with low emission such as electric vehicles, which include battery operated electric vehicle, plug-in electric hybrid vehicle, and hybrid vehicle, are expected to boost the demand for automotive active purge pump during the forecast period. Road transport is a major source of atmospheric pollution. Stringent exhaust emission regulations have been laid down by the European Union, mentioning certain mandatory requirements regarding emission in order to improve air quality. This is anticipated to boost the automotive active purge pump market during the forecast period. An automotive active purge pump offers several benefits, apart from extracting hydrocarbon emission from the canister, such as detection of hose off for emissions acquiescence, monitoring of on-board diagnosis for hydrocarbon evaporative leak detection, and pressure sensing. The automotive active purge pump is a modifiable product that can be customized according to end-user applications and systems and can enhance additional function and operation through integration of algorithms. This is a key factor that is projected to propel the automotive active purge pump market during the forecast period. Hybrid vehicles are gaining preference among buyers owing to low emission. This, in turn, is expect to drive automotive active purge pump market during the forecast period. The non-metal material type segment is projected to hold a prominent share of the market. Cost-effectiveness and ease of availability of non-metals across the world provides the segment an edge over another segments. In the automotive industry, consistent replacement of metallic components with non-metallic ones in order to make the vehicle light and efficient is expected to boost the non-metal segment during the forecast period. Based on components, the DC motor segment dominated the automotive active purge pump market and is estimated to account for a prominent share of the market, in terms of revenue, in the near future. DC motor is a major component of the automotive active purge pump, which is employed to drive the automotive active purge pump. It converts direct current electrical energy into mechanical energy and possess high efficiency and excellent controllability. Government emphasis on carbon emission legislation for automobiles is boosting the automotive active purge pump market. In terms of manufacturing process, the vacuum forming segment is expected to witness expansion at a significant growth rate owing to the increased number of plastic components in the automotive industry. The vacuum forming process for plastic provides advantages such as flexibility, cost-effectiveness, and rapid pace of production. This is due to the replacement of metal components by plastic, owing to its advantage of being lightweight and economical. The aftermarket sales channel segment is anticipated to expand at a significant growth rate, as compared to the other segments, during the forecast period. This is due to the increased awareness about emission and frequent replacement of electronic components such as sensors and ECUs owing to malfunction and their shorter lifespan. The aftermarket segment is also expected to expand owing to the emission regulation, which is expected to prompt existing vehicles to be incorporated with automotive active purge pump during the forecast period. Based on vehicle type, the passenger vehicle segment is projected to account for a prominent share of the market owing to the increasing demand for passenger vehicles across the globe. Demand for automotive active purge pump is expected to remain high owing to rising urbanization and hub-spoke architecture in different countries, which in turn has led to the increase in overall vehicle sales. This, in turn, has propelled the usage of passenger cars significantly, which is anticipated to boost the automotive active pump market during the forecast period. Furthermore, emerging economic conditions, increasing population, increasing per capita income, easy availability of finance, and high degree of urbanization are also expected to boost the passenger vehicle segment during the forecast period. Europe dominated the global automotive active purge pump market. Europe and Asia Pacific are anticipated to dominate the market during the forecast period owing to the high rate of adoption of the technology and rising awareness about emission in these regions. This, in turn, drives the vehicle penetration level in these regions at initial stages, being on a higher side than other mass manufacturing regions. The market in Europe is also expected to expand at a significant growth rate owing to Euro emission norms. Real-world testing by means of a portable emissions measurement system (PEMS) in the region has become increasingly important, as it provides complete emission profile for the real usage of an engine. The implementation of these tests has led to the introduction of WLTP, in 2017. These are performed for determining on-road emissions of regulated, gaseous, and particulate emissions. Europe is home to major auto manufacturers, who are developing the product in order to provide superior performance, thereby driving the automotive active purge pump market.